High potency anthocyanidins, natural source plant extracts. 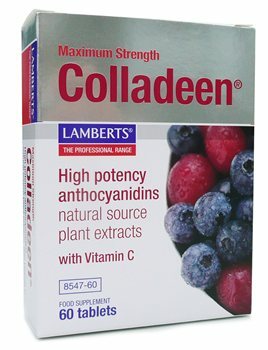 Colladeen provides a particularly rich source of anthocyanidins (plant flavonoids) from extracts of grapeseed and bilberries. Research has shown anthocyanidins to be powerful antioxidants as well as identifying the important role they play in maintaining the health of collagen. Collagen is the most abundant protein in the body - it is the protein that forms connective fibres in tissues such as skin, ligaments, cartilage, muscles and capillaries. Di Calcium Phosphate, Grapeseed Extract, Cellulose, Tablet Coating (Colours: Titanium Dioxide & Iron Oxides, Hydroxypropyl Methylcellulose, Glycerin), Bilberry Extract, Crosslinked Cellulose Gum, Stearic Acid, Magnesium Stearate, Silicon Dioxide. Take 2 capsules daily, 1 in the morning and 1 in the evening, for the first two months. Thereafter, for maintenance purposes, take 1 tablet daily or as directed by a practitioner or pharmacist. Colladeen does not have to be taken with food. Lamberts Double Strength Colladeen is an excellent product. I felt its anti-inflammatory effects almost immediately.